Why aren’t they blooming? Why are they pink when I want blue? When do I prune? Well, the link below from Proven Winners tells all including when to have patience. 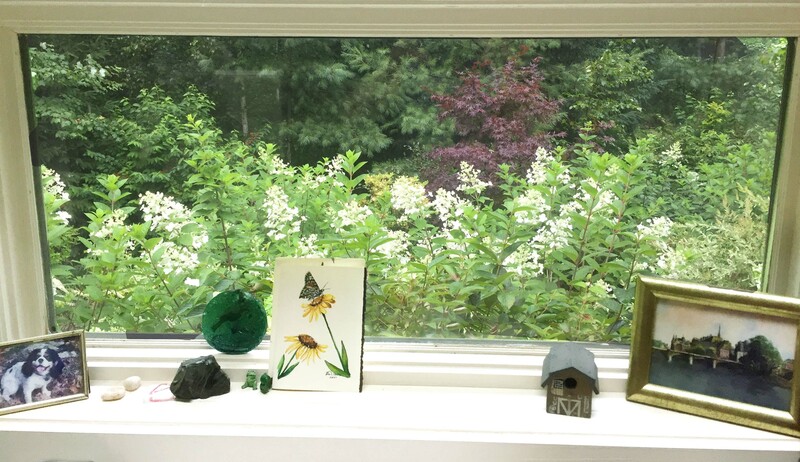 Now of course, plants don’t always read gardening books so if you have hydrangeas that are not behaving give them more light, water, or time! Where was the snow in February when we wanted it? 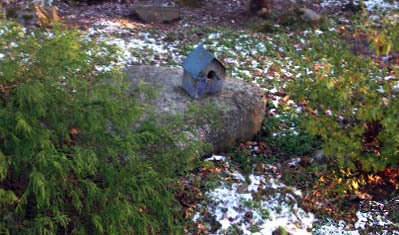 It was waiting for March when we want to garden and see our spring landscapes. 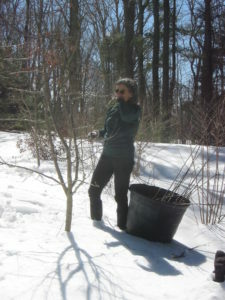 One of the many great things about having fruit trees, is they want attention in March regardless of snow on the ground. Although many of us are itching for things to grow, garlic mustard and other weeds have started as have ticks…so check yourself. I’ve been shoveling piles of snow on to the driveway to aid Mother Nature, and I was rewarded with daffodil leaves starting to turn green as are primrose leaves. Even my fothergillas are budding out. 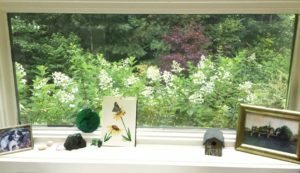 To deal with my garden “antsyness,” I continued planting vegetable and flower seeds, and visited Ward’s spring display bursting with flowers and fragrance. I know true spring will be here soon since it seems to do that every year. Pruning in the snow. YES! 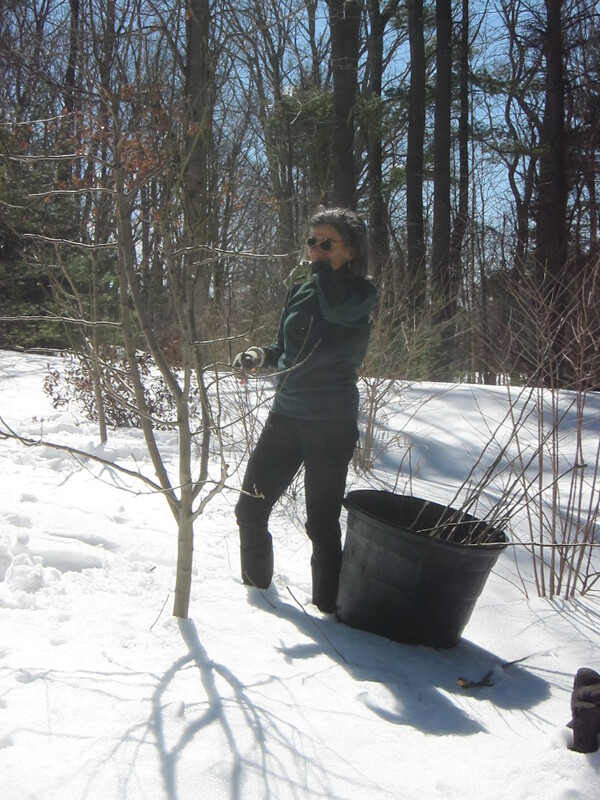 Pruning & Snow – You betcha! The great thing about having snow on the ground means I could reach high up into apple trees when I was out in the garden pruning this week. The experience also ramped up my fantasies; after a long winter, there is nothing like a landscape filled with pink, white, and rose-colored blossoms blanketing fruit trees in the spring. 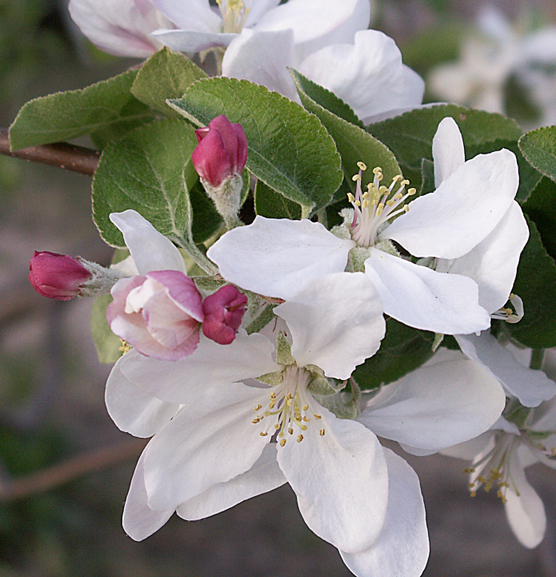 Now is the time to prune your apple, crabapple, and pear trees. There are numerous YouTube’s Pruning stimulates growth, increases the sunlight into the plant, improves the shape, and allows airflow – great for reducing pests. Blueberries rarely need pruning except for removing branches that cross other branches. Before you get started sharpen and clean your pruners, loppers, and saws. Having a dog nearby to throw the sticks to also increases the fun. The time to garden has finally arrived. Hurray! Now that’s a beautiful Berkshire view out my office! 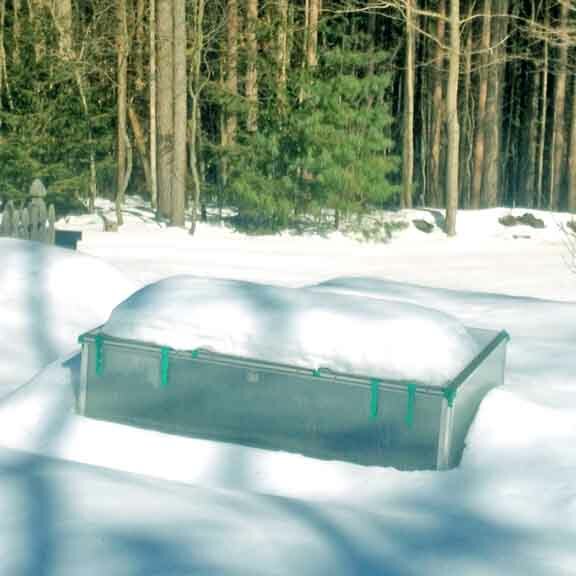 Okay, you can’t begin planting, but don’t let the snow stop you from planning your garden. 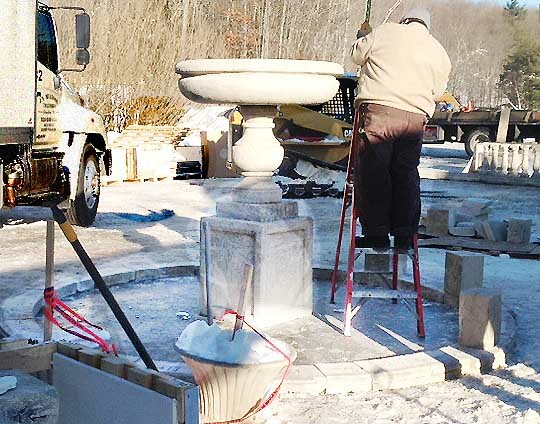 Instead, use these frosty days to to take stock of your landscape. Since you have to be inside anyway, start with the windows you look out most. What would you like to see? A lot of people have windows in the kitchen. Ask yourself when are you there most? How much sun does the area receive in the spring and summer? 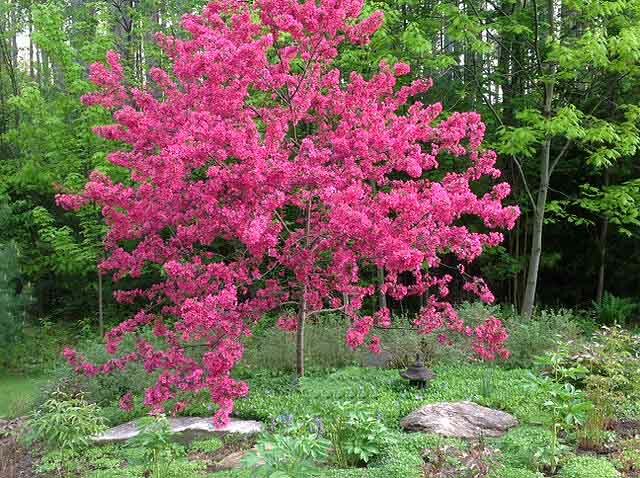 Do you want to look at vegetables, herbs, evergreens so you have color all year, shrubs, perennials, or a combination of them all? 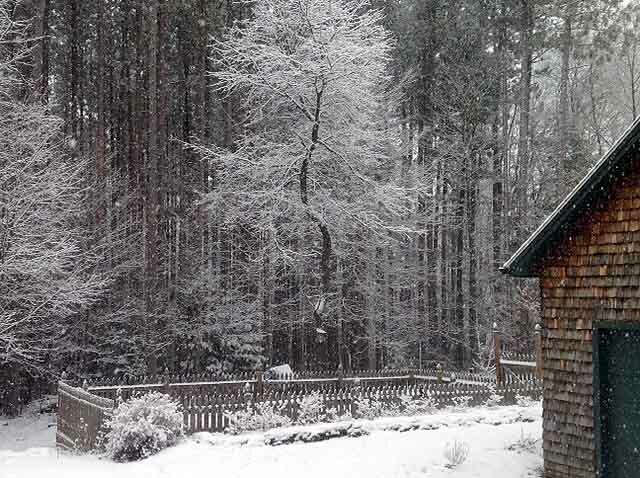 Do you look at your neighbors’ house or the road in the winter, and would you rather not? This is a great time to think about areas you would like screen. On the other hand, are their areas where a beautiful Berkshire view exists only when the leaves are down. Maybe you’d like to thin the existing greenery to improve the scenery. What about where you eat your meals? I love eating breakfast and lunch inside while the birds are depleting their feeders outside. I’d rather they slow down, but I don’t get a vote on this. There are so many options for improving your landscape all year round including plants with winter interest…but that’s for another day. 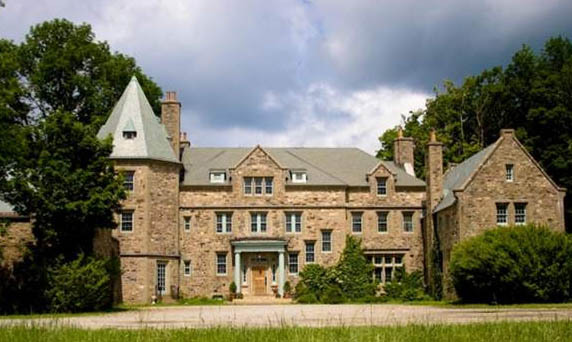 This linkis to a new group in the Berkshires who have restored Mepal Manor, a Berkshire Cottage and Italian-style villa in New Marlborough, and are bringing a new kind of residential help to the Berkshires for people with substance abuse issues. I am thrilled to be working on the landscape design aspect of this important program. Like all my clients, these people are wonderful! It was in the low 20 degrees today, and I was missing working in the garden, but then was warmed by this note from a special lady! I enjoyed it so much and feel so energized for all the projects that now lie ahead. I can’t tell you how reassuring it is to have someone come in with an expert eye and who also personally cares about helping me make my home look beautiful. For the first time since I moved in, I feel like I have a plan with concrete, achievable goals. 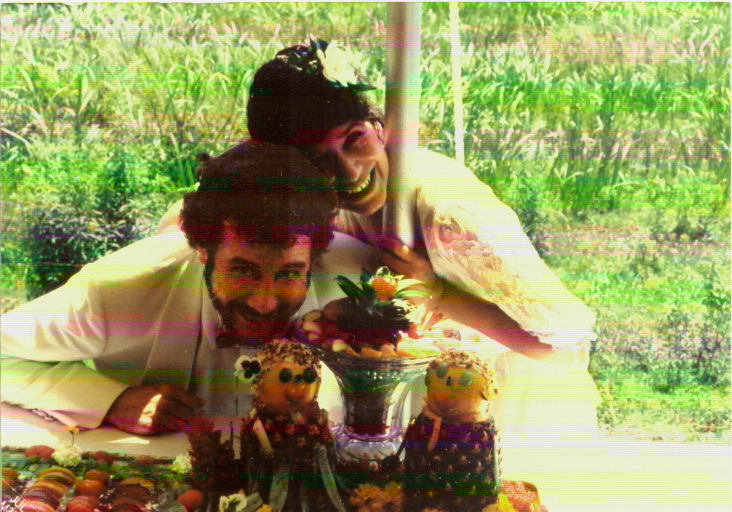 Thank you so much for traveling out to see me – those few hours you spent will be of help to me for years to come.